Mother Natures continues to prevent me from flying this winter. I have had two flights scrubbed due to extremely high winds and one due to all-around bad weather. I am hoping while I take some time off around the holidays I can fit in one more flight for 2008. In the meantime I have been thinking about flying and writing about flying, just not actually getting airborne. I have agreed to write periodic posts for AOPA's Let's Go Flying blog. The blog is dedicated to encouraging aviation enthusiasts to learn to fly. 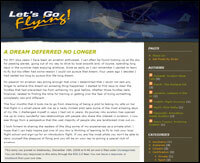 Please check out my first post for the AOPA Let's Go Flying blog - "A Dream Deferred No Longer". While you are there check out the posts from many great colleagues: Evan of FlyingToga, Paul of Ask a CFI, Andrew of 2fly, Jason of FinerPoints, Steve of Airspeed Online and Francois of Flyin' and Ridin' and Lauren.